Ah, the infamous compressor. Few things are more confusing to a new sound engineer than compression. The basic concept of compression is easy enough to understand. It’s the controls and proper operation that often baffles us. Understanding compression and how to use it is an essential skill for any mixing engineer. Mastering compression can make the difference between a good engineer and a great one. Compression and equalization are without a doubt your two most powerful tools in your toolbox for creating a great mix. So let’s start with what exactly the compressor does. We’ve talked in previous posts about dynamic range. A compressor is the main tool that we use to control the dynamic range of your tracks; everything from controlling spikes to smoothing transients. It’s even used as an effect in it’s own right. You can think of it as a smart fader – with an attitude. So what are the parts of a typical compressor? Let’s start with the threshold. The threshold setting on the compressor allows you to set the point where the compressor engages, or begins, compressing. For instance, if you want your compressor to begin working at -12 dB, then that’s where you would set your threshold. Threshold settings differ from track to track depending on the volume of the original track and the amount of compression that you want to use on it. The Ratio on a compressor sets the amount of compression that takes place when the audio crosses the threshold. Let’s say you set your ratio at 4:1, then for every 4 dB of volume that passes over the threshold, the compressor will only let 1 dB volume through to the output. it performs this feat continuously and smoothly as the signal continues past the threshold. This is a good place to mention that roughly 6 dB SPL of change, down or up, is equal to halving or doubling the volume, respectively. As an example, if you have a vocalist singing a song that has very soft parts followed by strong, loud bridges this track might be a good candidate for compression. 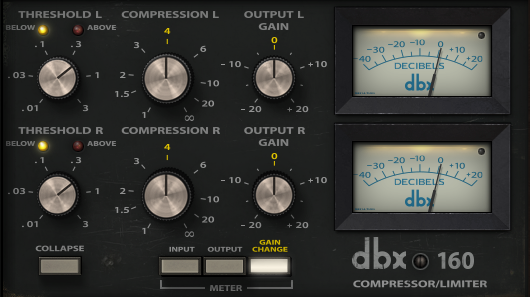 The ratio of compression that you should use is dependent on what you’re using the compressor for and how much dynamic range you’re trying to reign in. Now for the part that mystifies people more than any other part of this device: the attack and release settings. The attack setting is actually a delay setting. Here’s how it works. If you set your attack at 20 milliseconds (ms), then once the signal crosses the threshold, the compressed will wait for 20 ms before it begins the compression. Why would you want such a setting on the compressor? Shouldn’t you just want the signal compressed immediately? Sometimes you do. But more often, you don’t. The reason you want delay in the beginning of the compression cycle is to let the transient of a beat pass through without being compressed. In most modern music, the song revolves around the beat. The transient portion of a percussive sound carries the beat. 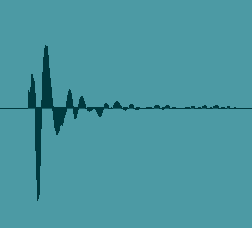 In this illustration of a typical kick drum hit, you’ll notice it has a very fast build up in the beginning of the waveform (attack), a peak (transient) and a slower decrease in volume as the sound fades out (decay). The peak is the transient and it’s the portion of the snare drum hit in this example that we want to preserve. By using compression in this way, we give the drum more energy, clarity and punch. Essentially, the threshold and an attack time work together to tell the compressor when to turn on. The release time tells the compressor when to turn off. If we continue with the same example and say that we have set our attack time to 20 ms we need to tell it next when to turn off or “release.” Our goal here is to set the release time so that the compressor disengages before the next attack and transient. Another setting found on most modern compressors is the knee setting. Some compressors will simply have a “soft” or “hard” knee setting. Some will allow you more variability. Either way, the knee setting allows you to “spline” the compression graph to create a curve. This lets the compressor engage gradually over a range beginning before the actual threshold and continuing past it. This creates a very smooth and transparent transition between the uncompressed and compressed signals. The last control I want to point out is the makeup gain control. When using compression, you inevitably decrease the volume of the original signal. If it is necessary to “make up” for that loss in volume, the make-up gain control is there to accommodate that need. It’s good to note that not all compressors that you’ll run into have all these controls. Some compressors like the classic and notoriously smooth Teletronix LA-2A has a variable compression ratio of about 4:1 and a fixed attack time of 10 ms. A tube driven electro-optical circuit measures the variations in the wave as changes in voltage. This is what controls the release time on this compressor. In fact, the only controls that it has on the front are an input gain knob and a gain reduction knob. The later models also included a switch to change the compressor into a limiter. This switch simply changes the compression ratio from about 4:1 to about 20:1. So now that we know the parts of a compressor, how should we use one? That’s a long answer so let’s save that for another post. But in the mean time, experiment with the compressors that you have installed in you DAW. They all work basically the same way but will sound slightly different. Some will sound radically different. Find one you like and start turning knobs. Now that you know what each knob does you can begin to unlock the power of audio compression in your mixes. Posted in Audio Production, audio recording, Audo Mastering.Tagged audio mastering, audio recording, k14studios.com, Kirk Farmer. Dithering, Is It Really Needed? Previous Post What is Phase Correlation? Should I be concerned? Next Post What does a limiter do? How do I use it?